Peepal or pipal (Ficus religious) Tree also known as "Ashvattha" in Sanskrit is a very large tree and the first-known depicted tree in India. A seal discovered at Mohenjodaro, one of the cities of the Indus Valley Civilisation depicts the peepal being worshiped. Once, all the gods decided to visit shiva. However, narad informed them that it was an inappropriate time for a visit as shiva and parvati were in solitude. But Indra did not heed the advice and assured the gods that there was nothing to fear when he was there to protect them. Narad reported Indra's arrogance to goddess parvati. She cursed the gods that they, along with their wives, would turn into trees. When the gods asked for forgiveness, she promised that as trees, they would attain fame. Thus indra turned into a mango tree, brahma became a palash tree and vishnu turned into a peepal tree. Once, Agni (the fire god) left the land of the gods, took the form of ashwattha and resided on the peepal tree for a year. Since then, peepal is also known as ashwattha. "The Supreme Personality of Godhead said: It is said that there is an imperishable Peepal tree that has its roots upward and its branches down and whose leaves are the Vedic hymns. One who knows this tree is the knower of the Vedas." "The real form of this tree cannot be perceived in this world. No one can understand where it ends, where it begins, or where its foundation is. But with determination one must cut down this strongly rooted tree with the weapon of detachment. Thereafter, one must seek that place from which, having gone, one never returns, and there surrender to that Supreme Personality of Godhead from whom everything began and from whom everything has extended since time immemorial." Some believe that the tree houses the Trimurti, the roots being Brahma, the trunk Vishnu and the leaves Shiva. The gods are said to hold their councils under this tree and so it is associated with spiritual understanding. The Brahma Purana and the Padma Purana, relate how once, when the demons defeated the gods, Vishnu hid in the peepal. Therefore spontaneous worship to Vishnu can be offered to a peepal without needing his image or temple. The Skanda Purana also considers the peepal a symbol of Vishnu. He is believed to have been born under this tree. In the Upanishads, the fruit of the peepal is used as an example to explain the difference between the body and the soul: the body is like the fruit which, being outside, feels and enjoys things, while the soul is like the seed, which is inside and therefore witnesses things. Women circumambulate the peepal tree to be blessed with children or to gain a desired thing or person. 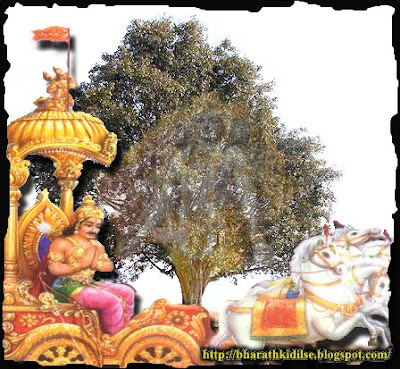 Peepal tree is planted in the temples of shani and hanuman. The tree is worshipped on saturday, especially in the month of Shravana, because goddess Lakshmi sits under the tree on this day. Any person who waters the tree is believed to earn merit for his progeny, his sorrows are redeemed and diseases cured. The peepal tree is also worshipped to escape from contagious diseases and enemies. There is also another story about two demons, Aswatha and Peepali who made the peepal treetheir home and attacked and killed all who came near the tree. In the end Shani bhagavandestroyed the two asuras and hence it is believed that it is auspicious to touch the peepal tree on Saturdays. 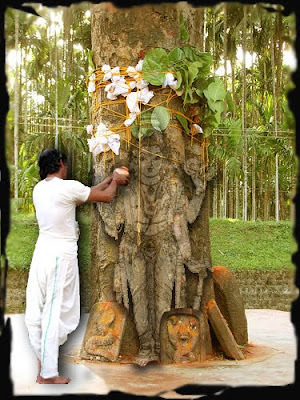 Tribals in bengal call the peepal tree as vasudev. They water the plant in the month of vaishakh and at times of difficulty. In Bengal, peepal and banyan trees are married. A peepal tree is planted to the east of the house or temple. Eight or 11 or 12 years after the tree has been planted, the upanayan ceremony is performed for the tree. A round platform is constructed around the tree. Different gods like Narayan, Vasudev, Rrukmini, Satyabhama are invoked and worshipped. All the rituals of the upanayan ceremony are performed and then the tree is married to the basil plant. In Tamilnadu, peepal and neem trees are planted so close to each other that they mix up as they grow. A naga (snake) idol is placed under them and worshipped. This is believed to bless the worshipper with wealth. Women take an early morning bath and circumambulate these trees. In Awadh, if a girl's horoscope predicts widowhood, she is first married to a peepal tree on chaitra Krishna or ashwin Krishna tritiya. In olden days, when remarriage was forbidden for girls, young widows were married to the peepal tree and then allowed to remarry. People belonging to dhantale caste who reside in Maharashtra, Karnataka and Madhya Pradesh use a branch of the peepal tree in the marriage ceremony. The branch, along with a pot of water, is placed between the bride and groom. The village deity is installed under the peepal tree which also provides a shaded place to hold the panchayat in many places. On Amavasya, villagers perform a symbolic marriage between the neem and the peepal, which are usually grown near each other. Although this practice is not prescribed by any religious text, there are various beliefs on the significance of 'marrying' these trees. In one such belief, the fruit of the neem represents the Shivalinga and so, the male. 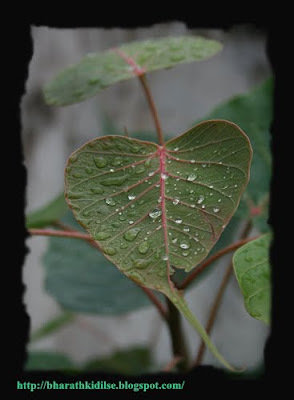 The leaf of the peepal represents the yoni, the power of the female. The fruit of the neem is placed on a peepal leaf to depict the Shivalinga, which symbolises creation through sexual union, and so the two trees are 'married'. After the ceremony, villagers circle the trees to rid themselves of their sins. Scientific research has revealed that among tress, Peepal is the only tree that produces oxygen in abundant quantity day and night, which is so essential for life. Peepal provides life sustaining oxygen, which proves it to be a life sustainer. Continuously research has also proved that the sound and interacting flow of wind, with peepal leaves, slowly but surely kills infection bacteria as well. According to the book of ayurveda, peepal leaves, fruits and bark are killers of diseases. People tree has both sweet and bitter taste and has a cooling property. Licking honey placed on peepal leaves is believed to cure speech irregularities. Its bark yields the tannin used in treating leather. Its leaves, when heated in ghee, are applied to cure wounds. Ingesting the bark, fruit and buds with different combination of things cures diseases related with phlegm, bile, inflammation swelling and indisposition etc. The soft bark and the bud of this tree cure 'Prameha' (a disease in which sperms emanate through urine). The powdered form of the fruit of this tree increases appetite and cures numerous diseases. very good collection,but not so much as the tree is. do it really works that a kuja dosha person marries a peepal tree first and then dey can marry the person whom they want...? so that the dosha gets destroyed....? Peepal/Banyan does NOT produce oxygen at night - its just a myth!! !